BLACKBIRD DESIGNS " AUGUST MELON"
Blackbird Designs " Summer Song"
This is a story about my daughter-in-law, Melissa. Melissa is married to my youngest son Carson. As I have spoken about THE CRICKET COLLECTION "ALPHABET" being my "beginning"... well, it sort of was Melissa's beginning too. Not really, but you will understand as you read on. 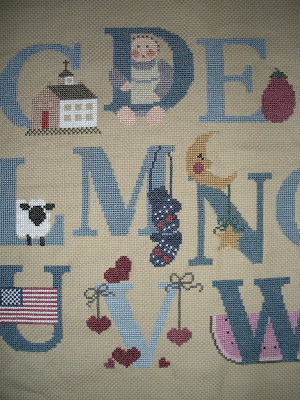 When Melissa stopped in she always looked at my cross stitching of the "Alphabet". She would make over each letter and tell me her opinion. As time went on I kept telling her she could do cross stitch too. Her reply always was the same...I don't think so. My reply was always the same too... if I can, you can. Well, one day Melissa was with me as I went to my needle shop. I noticed she was studying many stitched patterns. As the day went on we stopped in Michaels and I ask her did she want anything, she said no. I walked her around to the cross stitch kits and started showing her how she could do a small kit to start with, just to see if she wanted to further cross stitch. The first kit Melissa purchased was of sunflowers as she loves sunflowers. It was no time and she had that sunflower kit finished and framed. Was she ever hooked on cross stitch. That was all it took !! So, this is why I say my "Alphabet" cross stitching was what really got the attention of Melissa. In it's own way...it was the beginning of Melissa and cross stitching too. From the sunflower kit she went on to do a Harley Davidson motorcycle. This pattern when finished was for Melissa's father as he owns a Harley Davidson shop. I couldn't believe my eyes that she was stitching this Harley pattern as it was so detailed. It was unbelievable when finished and framed. It made her father's day !! The month of February ... Melissa was so busy. She stitched many Valentine's Day patterns as a surprise for Carson. He was very surprised !! She did her own finishing and such a neat job doing so. She did a block, easel and framed a couple patterns and door hangers. What a job she did !!! Melissa since has moved on to many patterns and has never looked back. At this time she is working on Winnie the Pooh calendar. She has added many buttons to go along with each month, it has added character to her work. Since the beginning for Melissa ... her love for cross stitch has developed into a great hobby. Her and I frequent the needle shops almost monthly to see what is new and add to our stash. I tell Melissa that she has passed me up as she does her own finishing details and is so creative doing so. I am very proud of Melissa and her cross stitch accomplishments !! So, the ending to this beginning is .... "if I can do it...you can do it !!" Well, Saturday night has come and gone, but the great memories will last forever. This was the best class reunion. Everyone was so happy to see each other and share all the school memories. Many classmates are planning the next reunion and wishing it were tomorrow instead of five years from now. I think that says a lot about our night. It was a wonderful evening !! This evening I will be attending my 40th Class Reunion back in my hometown. This is the largest class reunion my class has had in 40 years since graduating. Everyone seems to be so excited. So many classmates have moved to other states and are coming back tonight. Several say this is their first class reunion since graduation. I am looking forward to seeing my old friends and those I haven't seen in 40 yrs. I believe this will be the best reunion yet. The day is an ole hot, humid June summer day. It will be a good evening for all of us from the graduating class of "69" BRAZIL HIGH SCHOOL, Brazil, Indiana. We were surprised this morning by our daughter-in-law Karen with a coffee cake. Karen made the BLACKBERRY PEACH COFFEE CAKE recipe which is in this months SOUTHERN LIVING. She did a fantastic job and it was so delicious !! I don't have a picture of it but you can see a picture in the SOUTHERN LIVING magazine. This coffee cake is very moist and the fruit really adds a great taste. You can also see a picture of the BLACKBERRY PEACH COFFEE CAKE and the recipe on the blog... Stitching Up A Storm In Alamo City. Karen...Great job !! Delicious !!! Oh my my my !!!! I just got a peek at the BLACKBIRD DESIGNS "JUNE & JULY THREE STOCKINGS" ! These stockings just get better and better each month. I cannot wait to see the rest of the year of stockings. The month of June is "Celebrating Life", Double Wedding Ring, The Stork and Honeysuckle Vine. I just love the stork stocking !! You can stitch a newborn's name, date and year. How neat !! The month of July is all about being "Patriotic" (of course) Red, White & Blue, Stars and Stripes, and Summer Rose. The Summer Rose is soooo outstanding, just bursting with color ! And the Stars and Stripes, you gotta love the flag ! BLACKBIRD DESIGNS is giving this peek of the stockings, just go to blackbird-designs.blog. As I picked up the May Three Stockings this week the shop owner told me these stocking patterns are so popular. And I know why...they are so much fun to stitch ! I am looking so forward to getting my June and July Three Stockings booklets. Today I decided to check THE CRICKET COLLECTION to see if I was correct or just dreaming about a CHRISTMAS ALPHABET and yes I am correct. It is titled CHRISTMAS LETTERS by THE CRICKET COLLECTION. I found this pattern being sold by 123stitch.com. It is a pretty Christmas Letters pattern and looks very inviting. About 20 years ago I got this notion I wanted to cross stitch. There was no one in my family who did cross stitch, my Grandmother did knitting and sewing. So, what did I do...I walked into the local needle shop & started looking at the patterns. I tried to ask questions only to get a lady asking me did I know how to count and make an "x". That was as much information that this lady wanted to share with me. I decided that wasn't good enough for me as I kept asking questions. This lady finally decided I wasn't going to go away and she showed me cloth and how to get started cross stitching. I then picked out my first pattern and the color of cloth. 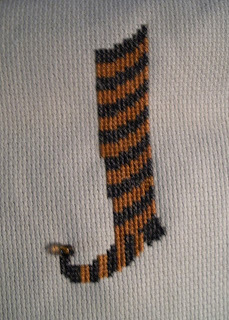 My first pattern was THE CRICKET COLLECTION "ALPHABET". I look back and ask myself "what was I thinking ?" I started with such a large pattern and having never cross stitched in my life ... I must have been crazy. I got started on the "Alphabet" and fell in love with all the letters and their characters. I used a dark tan cloth and I took this cross stitch project everywhere I went so I could sit and cross stitch. In the meantime, I started an advertising business and was so busy there wasn't much personal time and I put all of my cross stitch in my closet. I had nine letters left to finish. As life changed for me...I decided I wanted to do something on those long winter nights. I actually decided I wanted to do rug hooking. I tried to find classes on rug hooking with no luck. Just so happens I opened my closet door and there was all this cross stitch project in my basket starring me in the face. I thought to myself "oh my" and I took my basket out, sat down and thought "where do I begin". I studied this pattern and I picked up where I left off and I finished this "Alphabet" in about two months. So to this day I call this project my "beginning". 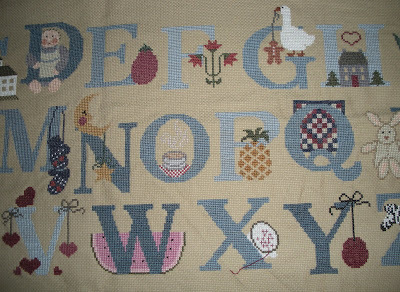 I went from the "Alphabet" to many other cross stitch patterns and have never looked back. And by the way...I did find a rug hooking class, that is another story another day. I enjoy rug hooking but my first love is "cross stitching". Now, to my embarassment, I haven't framed my completed "Alphabet". Yes, that is on my "bucket list". However, I am very proud of this super large pattern that I finished. The Cricket Collection is one of my favorite designers and to my surprise this pattern is still available. I bought the Alphabet pattern about 20 years ago. I laugh about the price tag... $4.00. I haven't paid that price for a pattern since. I would recommend the Alphabet pattern to anyone as each letter can be stitched by itself and also you can stitch words or names. 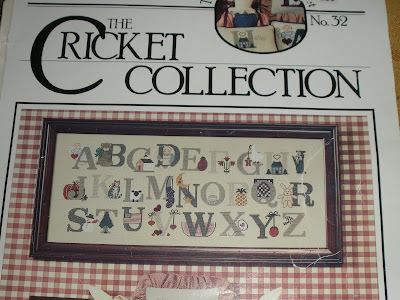 I am thinking there is a Christmas Alphabet pattern by The Cricket Collection. I think, hope I am not confused with another designer. Check back as I will be posting a picture of THE CRICKET COLLECTION "ALPHABET". Blackbird Designs is at the top of my list as a favorite. However, I have many designers that I like & have cross stitched some of their patterns. I, like many stitchers have a stash of patterns that are on my "bucket list". Just A Thought from Judy Odell is a great booklet to own, it is such a huge help on finishing all your projects. I would suggest anyone wanting to do your own finishing & having many questions on how to do so...buy this booklet. I am always excited to purchase my next pattern booklet and to see what colors of floss the pattern calls for. I ask myself everytime...why is it that I always need two skeins of a color of floss that I don't have. I look at my stash of floss and think to myself " I must have every color of DMC floss" only to find out...no, I still need two new skeins of floss. But to me,it is so much fun picking out new skeins of floss to see the colors. I actually love it when I buy several skeins to see how all the colors of floss blend together. Some take on the look of spring, autumn or just a variety of colors. So, where is this leading ... today I purchased my next Blackbird Designs Three Stockings for May. I may not get to stitch these stockings until I finish the August Melon pattern. I try not to have more than one cross stitch project. I like to finish whatever I am stitching on my lapframe, this way I keep my head into that pattern only. My favorite of the May Stockings is the Lilly of the Valley. I love how the colors blend so well. I have a feeling I am going to have so many stockings to stitch. 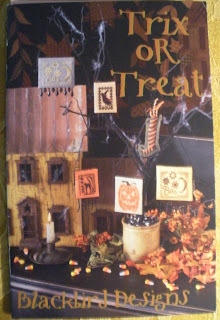 Just wait until the Halloween Stockings booklet arrives, I am looking so forward to this booklet. The 4th of July is just around the corner and with families and friends getting together I wanted to give one of my family's favorite recipe. Scroodles was given to me by a friend. You know recipes and gifts given by friends never let you forget who gave them to you. This recipe is one that everytime I make it I always think of my friend, Sharon Bassett. It has been three years ago today (Father's Day)that my family stood in line for over a couple hours among friends to view Sharon's body. Sharon fought breast cancer for a few years, thinking she had won the battle. The cancer came back, then she was in remission again and then it went to many other organs of her body. She gave it her all, as she did everything in life. 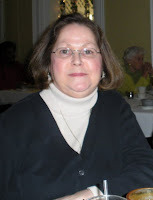 She was such a special person, she started the Sharon Bassett Breast Cancer Organization. She believed that every woman should have "HOPE" and she seen to it that when learning of another woman's breast cancer that she took to their home a large gift basket, gave the woman a new make-over and sometimes even a trip, just so they could feel good and have "HOPE" and want to continue on in life. Yes, Sharon was such a special gal !! Sharon never tired of giving and loved to give. So, everytime I make this recipe "SCROODLES" my family has memories of Sharon & her love for life. chopped green, red, yellow or red pepper, as much as you like. Chop onion, peppers & add drained olives. Add sugar, oil & vinegar. Make day before or early for meal. Can add cheese before serving.Optional. I hope all who makes this SCROODLES recipe will enjoy and think of a very giving lady. Today, Sunday June 21st is Father's Day. I want to wish every Father the most Happy Father's Day !! My husband Scott, son Craig, Karen, Little C & myself took my Father-in-law to a very nice restaurant for dinner. This was his Father's Day gift. Along with my Mother-in-law for her birthday being the same day as Father's Day. My husband says "everyday is Father's Day for him" as he works with both of our sons. And Scott wouldn't trade that for anything in the world. He says he is the luckiest Father !! My Father passed away 6yrs. ago this October. I think about "Dad" on Father's Day. As the saying goes... I think about my Dad everyday. I don't feel this ever ends. So, all of you who have your Father...please enjoy him this Father's Day. Give him a card, a hug or phone call if you can't spend the day with ole Dad. Make it the best !! I am in seventh heaven !! I read today the Blackbird Designs blog learning that the June & July Stockings booklet will be out in about two weeks. I can't wait to see the next designs. But I am so excited to hear that Blackbird Designs is having a Halloween Stocking booklet with 13 patterns of stockings. This booklet will be released mid-July. I am a Halloween collector. I love vintage Halloween collecting. I think it is from when I grew up in a small town & Halloween was a big deal. Our school parties included dressing up in our costumes and a parade down the street by the school. Halloween is still a big deal with me. I love the colors black & orange.Of course living in the midwest with our four seasons & autumn being my favorite it just goes along with Halloween. Halloween today is so different from when I was a child. But I still love Halloween & all that goes with it. Pumpkins, black cats, ghost & witches. We have trick or treating only one night & that being Halloween night. We still pass out candy and perhaps bags of treats, such as pencils or plastic spider rings. Halloween is one of the biggest celebrated holidays right along with Christmas. Now you can see why I get excited thinking about cross stitching Halloween Stockings. This is a must have Halloween Stocking booklet. Really looking forward to mid-July and receiving this booklet. Hey... all of you reading this blog, let me know what you think of Halloween. I am still talking about BLACKBIRD DESIGNS. I have started on AUGUST MELON & I have completed five of the letters. I love cross stitching letters as they stitch up so quick. I received my phone call today from the Needle Fever Shop in Indianapolis, Indiana informing me my BLACKBIRD DESIGNS MAY STOCKINGS booklet has arrived. I will stop in to pick my booklet up but won't start on the stockings until I have completed August Melon. I don't like having more than one project going at a time. It is fun to get a new pattern booklet & look the colors over and dream of your next cross stitch pattern. Trust me... I have a large wishlist of "what's next". I also have a large stash of patterns, floss & cloths. Always dreaming on the next cross stitch pattern. Today I was looking at Needleprint blog to find Mary Wigham samplers. Oh my !! They are so beautiful, so many pretty colors & designs. I don't know much about Mary Wigham samplers but I am sure going to do research. I know they are very popular and have many SAL's. Just wanted to say... if you love samplers, please take a look. Here is Blackbird Designs "SUMMER SONG" framed in a black/gold frame purchased from Michaels. SUMMER SONG pattern is in the Souvenirs of Summer pattern booklet. This booklet has six patterns. 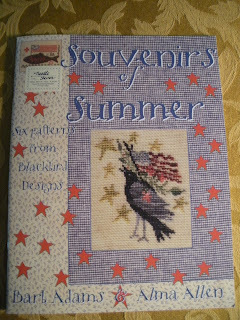 Great pattern booklet by Barb Adams & Alma Allen...Blackbird Designs. Such a great pattern to stitch. I enjoyed every minute of cross stitching & it is a quickie. I recently purchased The New CROSS STITCHER'S BIBLE. This is a great book for all cross stitcher's whether you are a seasoned cross stitcher or just beginning cross stitch. There are over 100 new charted designs & project ideas. You will fine many techniques for cross stitch. I love the colorful pictures. This book was first published in the UK in 2007. Jane Greenoff is the author and has done a tremendous job. I recommend adding this CROSS STITCHER'S BIBLE to your library. When I cross stitch I normally sit on my loveseat with my legs stretched out. I believe in being comfortable. I get my lighting situated, my basket with all the floss, scissors & pattern booklet. Then I am off starting to cross stitch. I use my Doodler Lap-Stitch Frame & just love it. It makes it so easy to stitch with both hands. I am right handed & never thought I could learn to use my left hand but I did. Surprised myself ! There are more than one size of Doodler Frames and more than one kind of Doodlers. I have the Doodler Lap-Stitch Frame that came with three different sizes of dowel rods. This is a great way to go for different sizing of cloth to stitch on. Just baste your cross stitch cloth onto the dowel rods & start stitching. Tighten the rods as needed and have fun. Myself, I prefer to stitch on a cloth that has a little bounce but tightened just right too. Personal preference I guess. My Doodler Lap-Stitch Frame was a Christmas gift from my husband. When I told him I wanted a Doodler he looked at me as if "what ?". I told him to go to my favorite needle shop. Bless his heart he did just that. Many Cross Stitch Shops or Needle Shops carry the Doodlers. If you have trouble finding a Doodler you can always google in and find them. Many are sold on ebay too. This is the website for the Doodlers. I have finally decided on the natural color of 18ct. Aida cloth. I have pulled all the floss colors and feel they look great together. 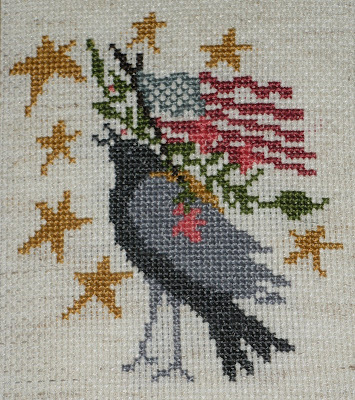 So, when I get to relax this evening I will start stitching on Blackbird Designs " August Melon". I love the colors in this pattern. Today has been an ole rainy day, the weatherman says we might have this most of the week. I was told today that the midwest may not have a summer this year. That is hard to believe. We have experienced a few high humidity days here in Indiana and summer is to begin this Sunday, June 21st. Here in Indiana on that day we start losing a minute of daylight each day. How crazy is that ? Summer starts that day & so do the earlier evenings. By August is when you really start noticing the longer evenings setting in. As a true Indiana Hoosier I don't mind the longer evenings. I feel I have more time to cross stitch. Summer Song is off the Doodler Lap Frame & would you believe framed. Yes, I got it framed tonight & planning on taking a picture tomorrow & then I will post the picture for all to see. I feel it turned out nice & love the gold color in the frame. The gold colored stars go well with the gold on the frame. I promise a picture soon. August Melon floss colors have been pulled and they are so pretty. I am going to decide tomorrow on my color of cloth. I am leaning toward a natural color. I have gone back & forth all night trying to decide. I believe the floss colors go well with the natural colored cloth. I have chosen 18Ct.Aida. I know Blackbird Designs pattern calls for 28ct.linen but I prefer Aida cloth over linen. I don't know why but for some reason I am stuck on stitching 18ct.Aida. I have tried my hand at linen with not much luck. I am not giving up on linen & will give it another try, just not at this time. I feel the finished look of a cross stitched project on linen is much prettier. When I decide on the color of cloth I will then prepare my Doodler Lap Frame. I love working with my Doodler Lap Frame as it makes it so easy to work with both hands stitching. I also have a 5" magnifying glass. How sweet that is !! I purchased my magnifying glass from K's Creations. It has the squeeze grip allowing to place it where needed. So, I will be starting on the August Melon by tomorrow evening. Looking so forward to my evenings of cross stitching. Next is ... Blackbird Designs August Melon. This pattern is in the Blackbird Designs pattern booklet A Fine Collection. I think it is one fine collection. It is a collection of each month. If you like Blackbird Designs cross stitch patterns, then you will love this booklet A Fine Collection. It is a must have cross stitch booklet. I am starting with the August Melon since it is summer & the water melon season. The colors with the water melon caught my eye. I will keep you posted as I start stitching. In the meantime, I have to take off my lapframe my Summer Song & get it framed. You forgot me .... is what my husband Scott said to me today as I told him about my last post. NO, as I said to him you are "what's next". This is our grandson " Little C's " favorite saying..."what's next". Scott & I grew up in Indiana in different countys. I always knew who he was & the same for him with me. His grandparents lived in my hometown. I always heard my classmates call him "Cotton Top" as he is a true platinum blonde. As our story goes...Scott ask me for a date & I told him no. Can you imagine that ? Six months later here he comes again asking me for a date. This time I thought if this guy had the nerve to ask me again after I said no the first time ....hmmm ... give him a chance. The first date was quite a night. This was 1974 & very snowy night. I still was second guessing myself about this date. As the night goes... I have my hair in large curlers as I had long hair. I had been ranting about not really wanting this date. As I go to turn on the shower the shower plug was up. Yes, I got a head full of water. By this time the night was on the wrong foot for sure. As I go to fix my hair, I end up with long flat hair on one side & curler dents on the other side. Cute huh ? I am all but ready & Scott arrives & my grandmother comes to tell me " your boyfriend is here". I remember telling Grandma "he isn't my boyfriend, he is just a date". My attitude not being the best, Grandma continues telling me..." I think he is a nice boy, I like him". Thanks Grandma !! Oh yeah, that was just what I wanted to hear that night. I walk into our front room to find everyone with big grins on their faces. My family was grinning because they knew how I had ranted not wanting this date & how I got my hair wet. Well, there stood poor Scott with a wondering what was happening look on his face. Ha. The date turned out fine, a very cold snowy night. Scott had a MGB convertible car with NO heater. Our date ended around midnight. As Scott's night was ending I forgot to tell him that my father had about a dozen Peacocks. Yes, you know a Peacocks scream... just as Scott took ahold of his car handle all the Peacocks screamed. helpppp, helppp !!! Scott says to this day he thought it was some woman screaming for help. And yes, Scott all but jumped over his car. Well, any other guy would probably have said .... I am out of here !! This August makes our 35th anniversary. Two sons & daughter-in-laws & Little C.
Scott & I have been in business all of our marriage. We also share our business life with our sons & wives. Scott has been the best thing in my life !! He has been the best husband, friend, father & grandfather anyone could ever have in their life. I love him dearly !! I am so blessed !! As Little C says... what's next ? In an earlier post I made the comment that I say "go for it !". Yes, I did "go for it" with this blog. This blogging business is new to me being the gal who is on the other side of the blog. That being .... writing my own post. 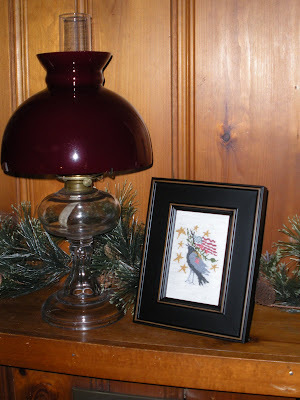 I have been reading & keeping up with many blogs, such as cross stitch, needlepoint, punch needle, rug hooking, decorating, recipes and life in general. On Thursday, June 11th my new blog became a reality. Cross Stitch Woman !! This cross stitch blog was made possible because I have a very talented daughter-in-law & son who helped me with all behind the scenes workings. Therefore... a huge THANK YOU goes out to Karen & Craig !!! My daughter-in-law put in many hours of helping me design & construct this blog. There will be additions coming as time goes on. Cross Stitch Woman is a cross stitch blog, however, for those of you who will be following my blog may be reading more than cross stitch news from me. I will be talking about my favorite cross stitch designers coming up & some of my experiences learning cross stitch. I feel I am just now coming into my own cross stitching. Such a wonderful hobby ! Oh yes... I have only one grandchild. "Little "C" ". I have to talk about him too, afterall, he is Grandma's boy ! He is the child of my oldest son Craig & Karen. Little C will be 4yrs. old this August & attends a Christian Preschool. I think he is the brightess 4yr old I have known . I know...he is my grandchild ! I have another son, Carson & his wife Melissa. Melissa is a cross stitcher too. I am very proud of Melissa learning cross stitch but also she does her own finishing. I tell her that she has passed me doing finishing. I will talk more about Melissa & her cross stitching another day. Thank you Karen & Craig for all your knowledge & making Cross Stitch Woman a blog. Last, I have finished Summer Song & will be posting a picture of the framed project. I think making a trip to Michaels to buy new floss, new colors for a new pattern is exciting. Don't you just love looking at the colors of floss ? I sure do ! This trip to Michaels I also bought frames to frame my Summer Song pattern. I am almost finished with this pattern. I can't wait to frame it. Then I will post a picture of my finished cross stitched project. I decided while browsing the cloths to buy an Antique White Aida 18 Count. I am going to get really gutsy and dye this cloth. I haven't made up my mind to dye with tea or Rit Dye. Never in my mind did I think I would try to dye cloth. I think this will be fun, interesting but also make me a little nervous. I always say... go for it ! Well, I am going to go for it. I will report my experience on cloth dying another day. Wish Me Luck !!! Please have a great weekend & check back soon. This pattern is in the Blackbird Designs booklet "Trix or Treat". This pattern is small but took me longer to stitch than I ever thought. I added an "E" bead on the toe of the stocking. I still have the backing to put on to finish the stocking. I have more stockings that I have completed & I will be posting them at a later day. Check back often to see my updates. When I finish the back of each stocking I will post pictures. This is a new beginning for me. Cross Stitch Woman !! 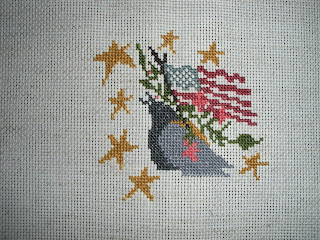 My newest project is Blackbird Designs "Summer Song" . It comes from Souvenirs of Summer booklet. This booklet is great with six patterns. I recommend anyone who loves Blackbird Designs to purchase this booklet. I am half way finished with this pattern "Summer Song". I love this pattern because it is a small & quick pattern. When I have it finished I will be framing it.